With different controlling and display options like 3G and Wi-Fi control, the display is easy to operate from anywhere. Show real time information transmitted through 3G or Wi-Fi. 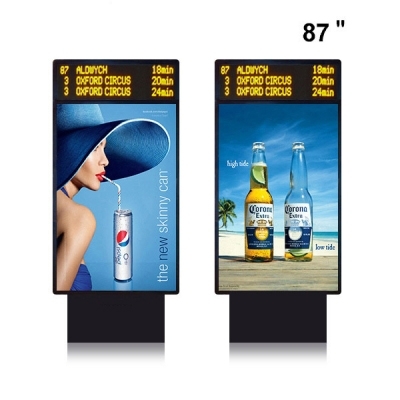 Can be used at crowded places like shopping mall, supermarket and others to show your ad. The cabinet of Business Advertising features unique rugged design which makes it easy to carry and install. The lightweight cabinet is easy to carry and saves transportation cost. It's damage free and lasts for a lifetime. Pick out from different standard colors of cabinets. Dış mekanlarda ekanlarımız yüksek parlaklıklı çıktıları destekler.Yüksek parlaklığı ve yüksek çözünürlüğü ile otobüs istasyonu için LED ekranı mükemmel görüntü ortaya çıkarır.Sahne,banka,otoban,promosyon,istasyon,stadyum ve birçok dış mekanlarda şahane bir şekilde durur. The advanced assembled structure produces seamless display and visual effects, offering you the perfect visual performance you desire from your Business Advertising LED display. The picture quality remains high due to best quality display material. The LED display can be connected with different devices through cable for real-time control. Keep an eye on everything through remote controlling. Remote management allows you to manage the activities from anywhere. Highly suitable for public announcements.